Time to compare the ebonite King of Pen and the Classic Pens LB5. This comparison makes a lot of sense, because the LB5 is based on the King of Pen. This entry was posted in Fountain Pen Shootout, Fountain Pens, Reviews and tagged Cartridge, Cartridge-Converter, Classic Pens LB5, Classic Pens LB5 Kaen, Converter, De Roos, De Roos Vulpenspeciaalzaak, fountain pen shootout, Gold Nib, Nagahara Nib, Sailor, Sailor King of Pen, Sailor King of Pen Ebonite, Specialty Nib on February 15, 2017 by sbrebrown. 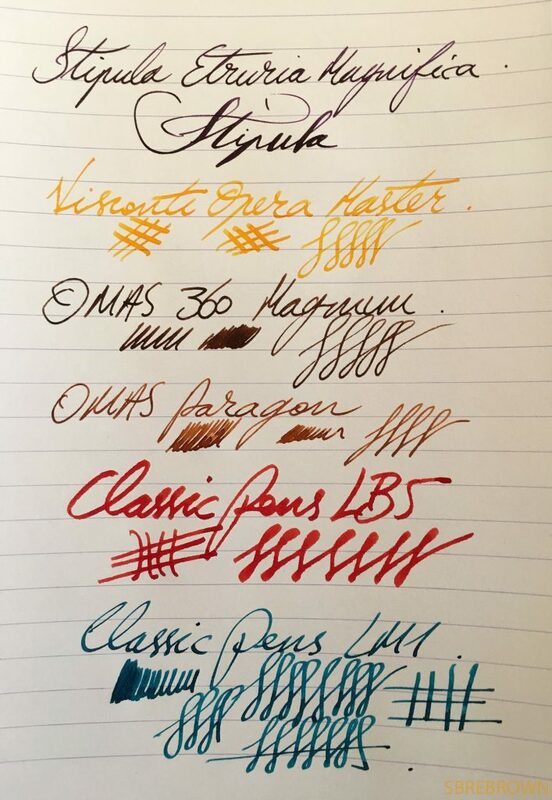 In this new series of videos, I share the pens and inks I am taking to work that week. This entry was posted in Fountain Pens, Information and tagged Cartridge, Cartridge-Converter, Classic Pens LB5, Classic Pens LB5 Kaen, Classic Pens LM1, Classic Pens LM1 Flame Red, Converter, Cross Point Nib, Gold Nib, OMAS 360 Vintage, OMAS Paragon Arco Celluloid, piston filler, Power-Filler, Stipula Etruria Magnifica, Visconti Opera Master Tobacco on January 13, 2017 by sbrebrown.